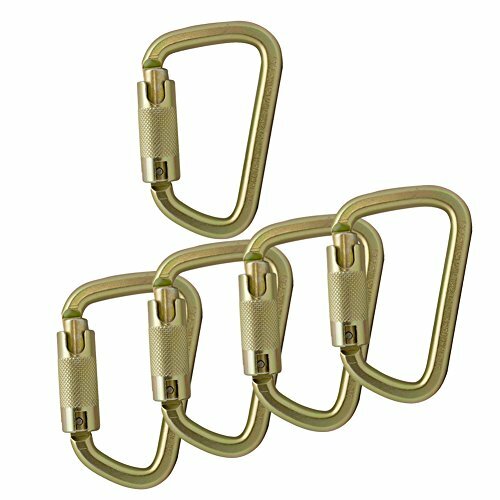 - Outer dimension: 4.45" x 3"
- This modified D-shaped carabiner is strong and versatile. - It has a large, snag-free, key-shaped nose and generous opening for easy clipping. - The alloy steel body and auto-locking gate provides extra strength and its captive eye pin keeps rope or webbing from slipping. - Auto-locking decreases the possiblity the user will forget to lock the gate and prevents the gate from unlocking due to vibrations while working. - Captive eye pin keeps rope or webbing from slipping. - This makes it a great choice for a wide variety of industrial and sporting applications.